This Mercedes E Class is available in Silver, Black, White, Red, Blue other colours and lease options, subject to availability and includes a warranty. The Mercedes E Class is synonymous with quality, comfort, power, prestige, refined engines and luxury interior space. Now even more supercharged, more powerful and economical than the previous series. All models make journeys relaxing, calm and comfortable. However, if you have that urge for some power, just press the sport or sport+ button and then suddenly you feel like you are in a space rocket. Which Mercedes E Class are you going to lease today? We offer top quality Mercedes E Class from brand new, nearly new, slightly used or ex demo, whether you have good or poor credit rating, pay a low or no deposit. These Mercedes E Class can be leased or financed and come with a warranty, HPI checked and when contract hire leasing, include UK nationwide delivery and AA or RAC Roadside Assistance cover for peace of mind. 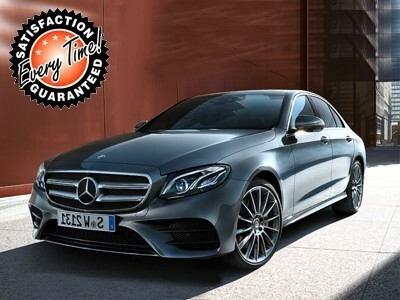 Time4Leasing can offer you the latest Mercedes E Class lease deals at lower prices because these vehicles are exclusive and offered at lower rates to customers that have good, poor or even bad credit history score ratings. Many buyers don't want just a thrusting sports saloon; they just want something that will make journeys relaxing, calm and comfortable. That's exactly what the Mercedes E-Class delivers. However, if you feel the urge for some extra thrilling driving, once you click the switch from Economy Mode to Sports Mode the E Class from a solid family saloon becomes one beast with endless pulling power from any of the diesel engines you pick. Provided you choose the right one, that is. Each version comes on a different suspension set-up, which changes the car’s character. The SE’s soft suspension is comfy, but the handling is a little soggy. AMG Sport models are firmer, while the models with air suspension are terrific, but pricey. There’s a wide range of engines to choose from, too, but we reckon the E350 CDI diesel is the pick of the range because it’s smooth and strong, and averages over 45mpg. True, the E220 CDI, E250 CDI and E300 Hybrid models are even more efficient, but they sound far too grumbly, which ruins the car’s refinement. You might also like to look at better deals like the BMW 5 Series that have to offer. There are 54 Mercedes E Class Lease Deals on Offer.